This table comes from Jerome Guilet's blog on Daily Kos, and represents his own calculations. It does nor reflect hidden costs. 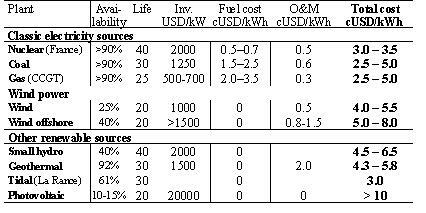 Thus health related costs due to air pollution from coal fired power plants are not factored into the cost of coal generated electricity. The cost of wind generated electricity does not include the cost of maintaining and operating back up and load balancing generating facilities. This is done with coal or gas, hence there are also hidden costs associated with pollution and CO2 emissions. Advocates of wind power insist that it does not require backup. This is only true if wind generation is always being balanced by fossil fuel generators. Wind generated electricity is of value if we want to cut CO2 emissions from fossil fuel power plants. When the wind is blowing utilities can cut back on burning natural gas or coal, and feed the wind generated electricity to the consumers. The problem with wind is, of course, that back ups and balances can never be eliminated. Thus wind generated electricity will never truly replace coal or gas. At best wind power will cut the generation of CO2, it will not stop it. If our goal is not to supplement fossil fuel power but to replace it, we will have to look elsewhere. My goal is radical. If we are to reduce the emissions of CO2 by 80% by 2050, we simply need to stop burning fossil fuels to generate electricity. Our society uses enormous amounts of electrical energy, and if the use of fossil fuels in transportation is to be replaced, the demand for electricity will only increase. Providing the electricity our society requires is virtually impossible with wind, given its limitations. Wind does not fit well in a renewables energy mix. The one exception to this rule is hydroelectric power. Winds do sometimes blow at night, but not reliably so. Thus wind generated electricity is not a good match for solar power. Geothermal energy provides reliable base power, and its price is closely matched to wind's. There is no reason to substitute wind for geothermal. Nuclear power works best by continuous generation. Thus the load balancing pairing of nuclear and wind would not work well. Wind works best with Gas, Coal and hydroelectric. The hydro-electric resources of the United States are limited. TVA, which operates a large dam system, gets 10% of its electricity from hydro power. It might make sense for TVA to match its hydro generating capacity with wind, if it had wind resources. Unfortunately the American South East has very poor wind resources. Thus if coal and gas are to be eliminated from the energy product mix, wind generation will be eliminated as well. This is the paradox. The future of wind generation is tied to the future of fossil fuel use in the generation of electricity.